Tuesday held no surprises as the market did a ramp and camp, which fits the terms of the technical bounce discussed yesterday. Toward the close, I wrestled a bit with the wave structure, but in the end decided it appeared a little more likely that the rally would carry forward in at least one more leg. It does remain plausible that the fourth wave completed yesterday as part of an expanded flat, but that's the alternate count. I don't think it's entirely clear-cut, and I would say I'm split maybe 60/40 on the odds between the two short term counts. Any print above yesterday's high would rule out this alternate. The short term SPX chart is below. Theres been no material change in this chart since yesterday, but we now have a more accurate "perfect world" target for wave c of 4, at 1384. Support/resistance levels are shown in black, and the rally stopped right at 1375 resistance yesterday. If for some reason the rally can't make it back up to the blue target box (it doesn't have to get there tomorrow -- I'm speaking more in general), then that would (obviously) be bearish and could indicate that this count is too conservative. Yesterday's "aesthetic chart" covers that possibility in more detail, but I'll worry about that more only if I need to. The larger degree alternate count (black) shown above considers the possibility that wave (i) has bottomed. Bears want to remain cautious if the bounce is stronger than expected, as possible warning that one of the alternate counts may be unfolding. Ideally, if this is a fourth wave, it should not sustain trade above 1388. What bothers me a little bit for the preferred view is the huge gap from 1398. This gives the bulls, and the market makers, something to aim for -- so do remain aware of the larger second wave potential, and if momentum seems to be increasing and 1388 can't contain, then bears may want to hold onto their wallets until 1398 or so. We're also still watching the big picture alternate count (below). On the upside, 1398-1400 is currently the level to watch for clues about this possibility. Closes north of 1398 would be bullish; conversely, a clean rejection at that level could kick off the next big drop. A few of the reasons I'm not currently favoring the big picture alternate count are shown below. 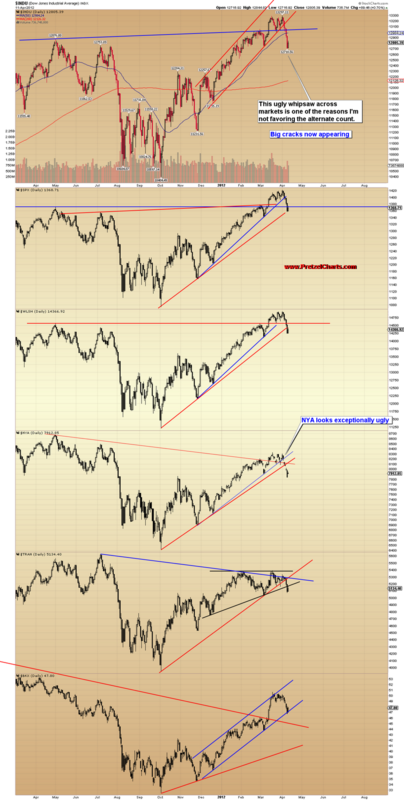 NYA and INDU look particularly weak, and have both broken their March lows. In conclusion, yesterday's bounce was as expected, and another leg up of roughly equal length would fit the terms of the preferred count. After we have some more solid indication of where the assumed wave 4 has topped, we'll calculate some targets for the next wave down. In the meantime, there are several levels for bears to watch which could give warning that one of the alternate counts was in play. Trade safe. My 120 ES has thrown off three dojis in a row, tough read at this point. no clear trend. . .
An interesting o/n pattern on ES. . .
Just bringing this correction forward to a wider audience. I'm sorry about the error in targeting. Hate when these things slip through. As an introduction to anyone that didn't see the original posting, here's a short description (from the original post): "Here's something I've been working on to help learn EWT. This is a macro-enabled Excel workbook that validates a simple impulsive wave followed by a corrective wave. It doesn't identify waves but it does validate them against the most basic rules. For instance, if you enter a Wv. 3 that is shorter than Wv 1 and Wv. 5, the workbook will call it out. The specific rules and the sources are listed on the 'directions' worksheet. It also identifies likely targets for waves proceeding from wave 2. Since Disqus can't handle non-image types of files, I opened an account at MediaFire (recommended by LifeHacker). Media Fire scans all attachments for viruses"
I second that. Outstanding and very clear. Comparing the effect 3 months ago when the up trend confirmed and job claims came in higher then expected this 5p of drop in SPX so far is lausy - ergo, need wait for me to re entrey short. I have monitored the put options on CVX from April 2 thru to yesterdays close. I was anxious to see which strike price performed the best with the expectation that CVX would decline to $100. I just read that and started laughing when I envisioned that you had forgotten the last word... "class". The one aspect that bothered me all day yesterday is shown in PL's first chart. Leg 3 is the shortest in both the S&P and Russell. 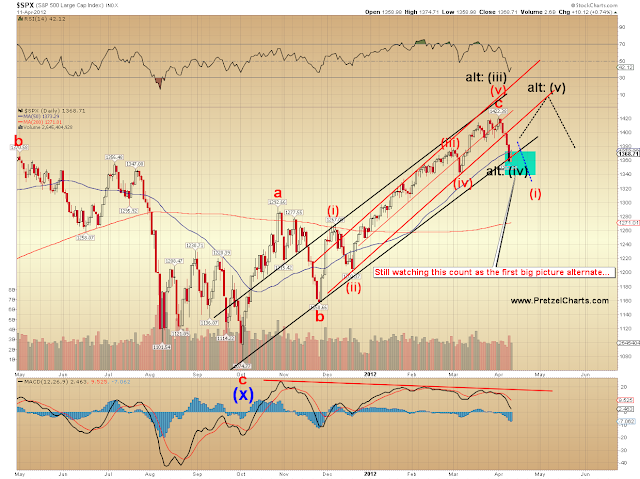 In the NDX it looks like something completely different, perhaps wave 1 of 3. So as is often the case, when I try to figure out EWT I get confused. I am confused. Therefore I am. excellent PL, clear and concise. If we go up to 1384s, the bulls think all is peachy again, and the bears have all but 1 -you- run for cover and then booooom: down and screw you all. marvelous concept! Hi kout.... haven't seen you in a long time. I see you've had your aluminum foil out again. Nice spreadsheet. In case you didn't see it, go back to the last thread and look at PL's explanation of how he achieved a 1000% return trading puts on CVX. Thank you, PL. After a couple of years trying to understand EW, I am finally starting to get it. So much appreciate the way you present this stuff! Possible fib retracements from the 847.92 high. 38.20% 808.14 - 50% 815.74 - 61.8% 823.33. I think 823 is possible but not today, imo. that would make a nice RS and setup the H&S pattern very nicely. Anyway today maybe 808 but I doubt it. Not trading advice. That's one of the keys alright. Mr. P. has the best writing talent of the whole works. To present it all in a relatively clear and easy to understand fashion is way tougher than it looks. MACD is rolling over and showing some divergence from A wave top. Could mean C is completing. This move higher in the Russell is definitely an impressive little impulse. Mind you, it "should be" whether it's a 'c' wave or something more aggressive. Lots of volume behind it though. I still think there's a good chance for a huge disappointment tomorrow when JPM reports earnings an hour before the markets open. Bloomberg says their earning should be good, therefore it's a short IMHO. I'm playing this MACD divergence here. Bear call spread on SPY, 138 short, 139 long expir tomorrow. Also went long 136 put apr expir. Tag team effort.....IBM going down, HPQ now going up. Max, what timeframe are you looking at for the MACD divergence? Thanks. JPM...hmmm...Corzine ran out of money to send them...so they'll likely disappoint. That would be a picture perfect H&S...(almost) everybody would see it. Thanks for sharing Max. Are you familiar with Phil Davis of Phil's Stock World? I was surprised to have seen him quote some of my work one time on his website and on SA so I started investigating a little more into what he was all about. I knew of him but only by his articles. I discovered that he's a master at options strategies and man, does he come up with some doozies (winners). Still, they're not as aggressive as our man PL did the other day, but they're still very interesting and something I plan on getting more into. In any case, his website is a subscription based affair but often he publishes his articles on SA where they're free of course. So you can find his website here. Or follow him on SA here. It would probably be worth your while to at least check him out since you're doing spreads. I'm thinking they will disappoint too but in all honesty it's just because I hate their guts with a passion. With a capital 'P'. But it's the timing of their release... an hour before the market opens... on a Friday? I dunno man, I just hate those crooks with so much enthusiasm that I might not be thinking clearly, lol. It's all about the wave patterns and TA really... that's where the real clues come from and we'll just have to see how today ends. But I'm betting that it ends with a very clear 'abc' correction upwards that flows really well with this initial drop down off the Apr. 2 high. I got long the Russell just at the right time and am really enjoying this little pump job today. I was expecting it obviously but I don't trust it as being a new bull cycle. My mind is open though. No, I'm not talking "sieve", lol. That's what I'm suspicious of too. But it seems way too early for it to complete. I'm really convinced that they're going to pump this puppy as far as they can before GOOG and JPM report tomorrow. Not sure when GOOG reports, but JPM is in the morning. Lately the RUT has been setting up some very nice IHS and H&S patterns. I like that fib number at 61.8 off the 783.56 low. Plus that hit and bounced on a TL from the 785 bottom. The weekly chart is setting up the same. So here is what the magic 8 ball is saying for July = 600. Just my meesing with patterns is all and this is PURE specualtion. Nothing to trade for. It seems to me that the gap is absolutely the target. I'm thinking 815ish. IWM also shows a real air pocket just above which should mean "clear sailing" just as it would mean "slice right through" if it's falling. So I think the road is clear for about 814-815. 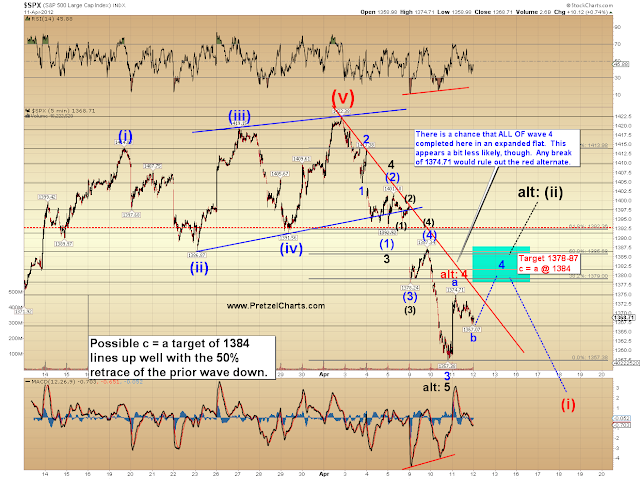 At 1384.40 this C wave will equal the A wave....time to turn? What made you choose June expiry? It it gets above 822.72 then it will have overlapped what we think was a wave 1 down.on Mar. 29. Hopefully it won't do that, otherwise we might be looking at another bullish cycle. So true AR. I hope it stops short of that. Once again I should not read the news and only trade what I see. Appreciate your point there as I did not look at that. Thanks again AR. What happened to the Flames and Oilers? What is up with the Canucks? Hey who did Tim Horton play for? For those trading anything RUT related, I just bailed out of longs for the simple reason that the current count seems to be a clear 5 and it's stalled right at the underside of the gap. Maybe it goes higher as I speculated only minutes ago but something tells me it's getting toppy. Just a hunch that it was time to take some green off the table and relax. I probably shouldn't mention this type of stuff anymore. Next time I won't. Thanks, AR. Indeed tougher than it looks. Quote of the day: "Screw Amazon." Steve Jobs, CEO, Apple Inc.
Hi PL...unfair question alert...just wondering how long do you think it takes to get more than just competent?...are we talking the standard 10k hours or is it just too complex a question? PL's 3/18 posting on CVX pointed to CVX putting in a 5th wave top. Mar Jun Sep Dec cycles tend to be the most traded (liquidity & volatility) chose the next cycle to avoid big premiums. June options would catch the "sell in May and go away"(if it happened) $100 was the expected target. "Ending Diagonals almost always return to where they began. Often the mark even larger trend changes"..direct quote from the 3/18 posting. CVX started the diagonal at $85. Could I catch all of the drop?Nenner was calling for a market peak on 4/19, so I couldn't go any shorter. Going against PL and to a lesser extent Nenner is like pulling on supermans cape. That's my suspicion. I know I speculated that RUT would keep heading higher to fill the gap but at the moment it just looks like such a perfect 'abc' that's completing that I just had to bail. I'm not really seeing any sell signals from the momo indicators yet but it got so darned far above moving averages that usually that's a good time to take some profits too. And then just sit back and let the market 'show us' what it plans to do. That's my kind of thinking these days anyway... a little more cautious. 1382.6 is the 38.2% retracement from the 1422 high and 1383.5 is the 38.2% retrace from the 1425 high. All close to 1384.4. I wonder if that's wave 4 done? Actually, at those levels I guess it's theoretically possible that we've just had the top of wave 2? PL *is* amazing, and generous also. That's why anyone playing the market and not hitting the Donate button is ignorant. You are absolutely right! PL is the man if it holds, and we have all found treasure in this site. I miss seeing your posts brutha...you must be busy. Can you specify the Prints that your discussing? If you're referring to the extended 3 down...it's close but wave 1 is shorter. I'm looking to get short because on the larger picture I believe we're in a bear now. On the other hand, as PL pointed out yesterday the McClellan Oscillator (NYMO) was way down there in a dangerous zone suggesting a bounce. Well we've got that bounce now but I'm not sure it's finished. But dang, it sure does look like a near-perfect 'abc' correction higher right about now. Might be time to ease into shorts pretty quick here. I was anticipating not getting the opportunity until much later today. Flames and Oilers pretty much sh$t the bed this year, lol. I like the Canucks too though. I think they'll be fairly tough although they're down one game. I don't follow it much these days, especially after so many years of the Flames being pretty weak. Oh man... Tim Horton was a stud. What a player. Tough as hell and a superb defenseman. He was so strong that when he got into a fight he'd put the other guy in a bear hug and break his ribs sometimes, lol. He was squeezing Derek Sanderson so hard one time that his ribs started cracking and the only way Sanderson could get out of it was to bite Horton. So that's what he did, lol. What a sad thing that he died way too young in a car crash. He played for Toronto mainly. That's where his fame really started to grow but he ended up with Buffalo. I responded to your question about wave 3 being the shortes below. Don't forget that I capitulated. Sure sign the market will tank. I genuinely have no clue how long. It took me a couple years, prolly. It's a *huge* kickstart to follow someone who's decent at it -- I followed a pretty pricy pay subscription guy (nobody anyone's heard of, most likely) many years ago, and that helped immensely at the beginning. You almost have to see it in action and being practiced by someone who understand it to really wrap your head around it. His updates never explained anything, though, they just showed charts and targets -- but even that was a big help early on. I think a lot of people like keeping it "magic" and intentionally avoid educating their readers... maybe that makes more business sense, since you don't necessarily want your subscribers to not "need" you any more. I made the decision early on to attempt to educate along with the charts. Anyway, bottom line is: I have no idea how many hours I have into it -- but it's a lot. 10k hours might cover just my time investment over the last week, lol. AR you are never misleading and I trade what I see now. I just got out of some RUT longs and did nicely. I appreciate another view to challenge what I see. Really I do appreciate it. Yeah, I'm seeing the same thing. do you think a last thrust to spx 87-88? Thank you very much for taking the time to reply. You really do share your knowledge in a way that is digestible to the reader. Your site has definitely been a "kick start" for me. I just have to put some fresh gas in the tank. :) You have a place in heaven, whereas I on the other hand will be fighting with AR over who gets to ride shotgun on the "other" bus...lol. Just be sure to get some well-deserved rest sometime. was that it? 1383.97, or we might see even higher? Were his initials RH by chance? To you as well my friend. I hope you know you're more than welcome to rejoin to good ones who now comment at my own place now? The king troll has been banned from there from day one and he was banned from this site yesterday. I hang out here and at home, both. Missed an 11% move in DUST this morning (so far) because I was working on something for a customer at my real job. Those damned customers, I wish they'd just GO AWAY!!! I am really close to matching my "earned" income by trading part time. The thought of focusing exclusively on trading is looking REALLY attractive right now. I would love to hear from any of you who have made this leap of faith. I just re-read PL's note above about sustained trade above 1388 and the gap at 1389. Good reminder. Possibly something like this to wrap it up, if the 4th wave count's correct. If it gets much beyond 1388, I'll start to worry about that wave count. Thanks for your input. The downside of trading part-time is that the more success I have doing that, the more I detest my job. lol! See... this is why I don't profess to be a good waver. The last time I was a real good waver was when the bus carrying the South Okanagan Bikini Team drove through town. I guess I can see it now. It can be stressful at times, but it's great never having to leave the house. Yeah, but you kinda "un-capitulated" recently. 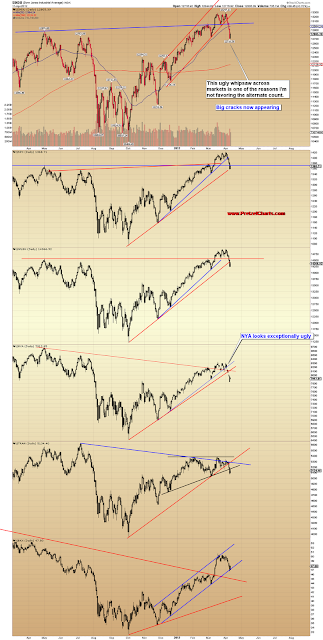 Market needs you to capitulate again! You're completely holding this thing up. Your job will also keep off the pressure to "always be doing something in the market" in order to make income. You will be able to sit out bad or difficult/unpredictable trading environments comfortably. I just did... with IWM puts. And I only used the profits from this morning's longs. I'm gonna let JPM buy these ones for me. You know... play with the house's money for a day, lol. And I replied. No it didn't help because I'm pretty stupid sometimes, lol. PL. question. I just got the prost and prechter book and was wondering if any new wave patterns/fractals have come to light, especially the corrective ones, or if these are "all" there ever will be? 2nd question; if I understand correctly, even 3rd waves can fail? Feels like the wind just died down.....bull sails went limp. The latest fractal discovered is the "Ben Bernanke." It looks like a bear with a shotgun in his mouth. Never heard of a 3rd wave failure, unless you're talking about a c-wave in a correction. Need a break below 1384.57.....then the trap door opens I believe. Just a heads up that the AAPL:NDX ratio is failing badly today. When that thing rolls over, the NDX is absolutely toast. It's not a confirmed breakdown yet but it's sure as heck not a bullish signal for such a bullish day. Charts are available in the article, here. If you're short of time, the most important one can be seen here. As you can see, it's far from being confirmed but as I mentioned, this is a very bearish occurrence for such a bullish day. Heads up! Forget ES, DX, NQ and all the rest. From now on, I'm only trading CVX! Got long at 101.30 this morning, and just sold it all at 102.70. Could be a little more upside there, but Imma take the money and run. Damn... I just posted what I think is perhaps a rather important notice about the AAPL:NDX ratio failing badly today and it ended up in the spam bin. There's no way I can post links for you. If PL can rescue it, great. Other than that... wait, I'll try to add the links below. Can't post anymore. Spam bin? Here's a little ditty about PL and Sue! Capitulate, or no prom queen for you! Question for whoever would be kind enough to answer. The 1388 level that we are watching, does that # come from the turn at 1387.34 and is that why it is significant and/or b/c it puts us into that gap down zone from April 9th? In short how is that 1388 number arrived at? Thanks for any insight you can provide. LMAO, I am just trying to picture fractal(ing) bernanke.... ugh, dude, that just gives me nightmares. Yes I was talking about the c-wave in a correction. Sorry if I wasn't too specific. Look at PL's first chart today. If Blue 3 is correcting today then no higher than low of wave 1 EW rule. 50% retracement is 1385.68 and 62% retracement is 1392.36. If we breach the 1392.36 then Black 5 is in. Authentic made some good observations. Your day job put somr structure into your day. It may seem constricting at times but not everybody can function properly in an unstructured environment - you can make your "work from home" a 24 hour thing. As Authentic says, see how you feel after an unfavourable run. sometimes we have to be bold and go foe what we wan't. But look carefully before you leap. How soon I forget...I'm gonna ride that bull baby...Ben won't let me down...lol...I'm signing up for some "...bull clinic" right now...here's the flyer for it in case anyone else is interested....Bulls rule!!! Please get some rest!!! We need you. In tomorrow's summary, if 1388 holds today what/when would be a good trigger for the bears? Thank you kindly Bob_E. I've been pouring over the chart and understand the W1 rule, but I saw that on the chart as 1392, but I see what you are saying about being 1/2 between the retracements and that low, etc. Thanks again for helping a brother out! Bob, is it time to start buying puts on CVX? Where are we at in the wave count? Would a down move be a wave 1? Great advice...always have more than one source of income if possible....cuz one of them might go south on you. Of course when the proverbial lockbox gets stuffed with money from one source or the other, you can always become a maverick. I plan on opening a school for low-income, inner-city kids...really...that's my goal. I got the never leaving the house thing down pat 'cept for the post office, bank, and dropping my boy off at school...I'm halfway there...Yee Ha!!! 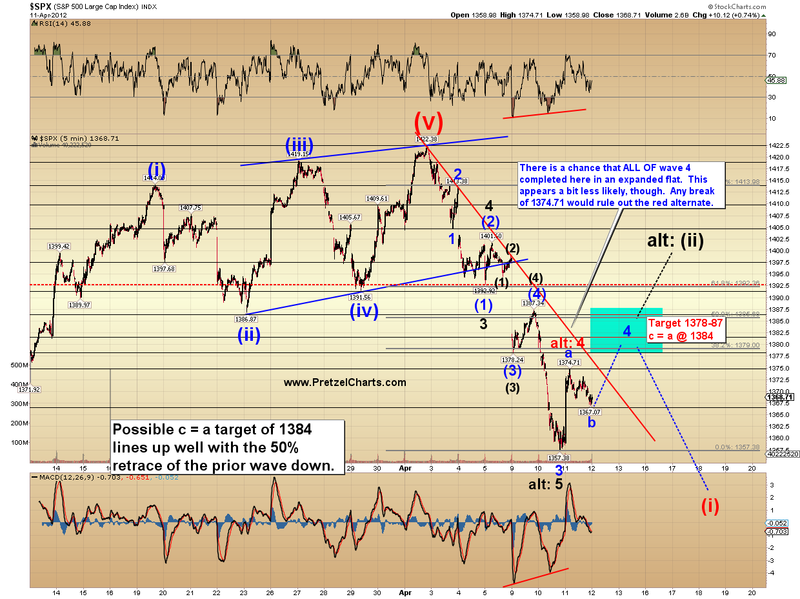 38% retracement of this third wave would be $103.50 approx, about a buck away from here. If PL's out on the long, then it's time to start looking at puts. Keep in mind the wave two correction appears simple...which then by the rule of alternation suggests this wave four will be complex. Scaling in here up to $103.50 is a low risk trade. Wave 5 down coming soon to a theatre near you. No...No it doesn't. I walk around most of the time with same amount of sleep as you get, and I really do find uninterrupted sleep one of the finer things in life at this point. Money never sleeps, and neither do I anymore. You just post it on your site and I'll repost it here. bullish day. Charts are available in the article, here. If you're short of time, the most important one can be seen here. is a very bearish occurrence for such a bullish day. Heads up! Simple meaning an abc corrective and complex meaning abcde? ROFLMAO...hence when my son goes potty, he shall have performed "a Bernanke". Runner...there is a big picture here that's truly thrilling. CVX has completed a fifth and final wave high at $112.28. According to EW rules we should expect a correction lasting longer and deeper than the most recent one which was from about $107 to $85. Couple that with what is happening in this current decline that we are in. Wave 1 down equals $7.43, wave 3 down equals $8.28...no extended waves yet in this series....that suggest that wave 5 down, soon to be upon us, should/could/would be an extended wave 5. So this next drop could be from right here at $103, down to $85 and in a hurry. Once there....extended waves ahve this fascinating aspect of "double retracement". The A wave correction (after 5 down) could retrace right back up to wave two within five down, and then drop right back down to $85 where it began. talk about taking candy from a baby! Gotta watch PL real close on this stock. It could be diamond in the rough. Yes on the simple.....but complex waves take additional time by moving sideways..kinda like an a-b-c X a-b-c Y a-b-c Z.......This correction may give us time to really load up for the next drop. I'll go rent a U-haul. Can someone explain WHAT THE HELL HAPPENED TODAY?? No real data and the charts are fugly! Brinks..... I think they may have what you'll be looking for. speculations on JPM and GOOG's earnings tomorrow. Sounds like good advice. I know I'll prolly jump ship and trade full-time at some point. It is truly my passion and I love the endless stream of knowledge and experience (from this site and other sources). Honestly, I spend at least 40 hours per week on this stuff anyway (mostly nights and weekends), so I figure I could cut my hours by more than half by quitting my day job and would likely not give up any income. I have been trading part time for 20 years and have developed a very reliable buy/hold/sell system over the past few years. 74% winning percentage on trades and my average winner is 4.4 times greater than my average loser. As far as "living through a losing streak" goes: been there, done that. Lost nearly half a MIL back in 2000-2001 (see recent post). That was no fun at all and I learned a huge lesson in cutting losses and not swimming against the current. Thanks. So I am guessing next move should be a massive down wave, do you have a target? Would you care to explain that comment? A buying frenzy in what? A "school of trading" is not a bad idea at all. does it bother anyone that this is a 5 wave up move? CVX...3:30 PM event via fib time ratios for CVX appears to be pointing to a high. Previous event time was 4/2 at 3:30 PM a high. I have no confidence, no real long term experience in this time fib relationship...but I'll keep it up on CVX. LOL...I finally signed up for the right class...prolly beats the hell out of EWI. RUT did not make new high with SPX, AAPL is down, volatility collapsed, how do we reconcile all these?? My apologies PL. I responded without even looking at who the query was from. In my response I was quoting you to you. Not sure what happened, but I did a reboot. I'm placing the dunce cap on top of the aluminum foil. of course my proposed pattern has to play out right into the close -- no matter, my money is where my count is...i bought a boatload of puts hoping my ED in the 5th of V plays out. Did anyone see what happened in the NQ? Glad I was short in the last minute! PL...could you open tomorrows analysis with an attached sound track "Take the money and Run" Steve Miller Band. I was waiting for Soupy Sales to come back on my screen??? What gives? I do remember reading your previous post on the subject. It sounds like you have a system and plan. Therefore I think the key is to establish a savings account that can support you and your family for 3 years without earning a dime. That account would have to be separate from your trading account and capital and they can not be mixed. Finally, I think you have to time when you that VERY CAREFULLY. An ideal time would be when the market is at a five or ten year low (think March, 2009), rather than when a market is near or making new highs. That would put a steady wind at your back to help you succeed. anyone know what time this chinese GDP # is ?? Is that a gerbel in the background? It is up to JPM and WFC tomorrow morning to either blow up the rally or keep it going. AAPL should be interesting with opex. Your vid with the dancin bears is all over the grid now. My home page for comcast ahs it playin constantly. You went viral dude! That's you in a bear suit...right? How'd you get my picture?